At first glance, one could perhaps be duped into thinking that these here limbs are just a run-of-the-mill pair of horse legs, and yes, to a great extent, they are. However, what struck me as unique (the horse is in fact called ‘Unique’. 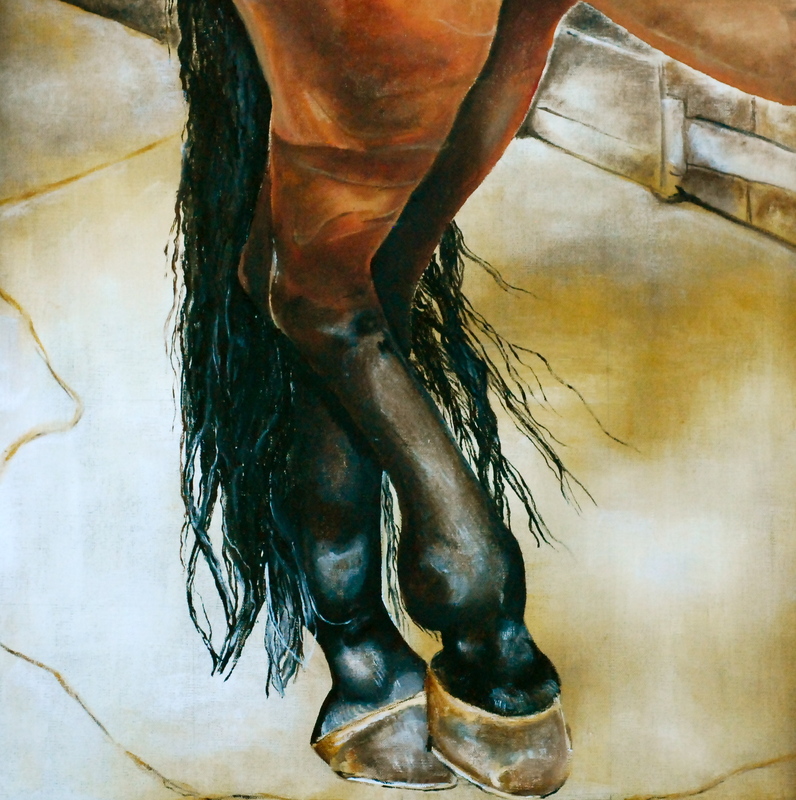 See what I did there…) about these particular equine appendages is the stance in which they are positioned – a rather dainty ‘quatrieme devant’ in fact – so much so I simply had to recapture the moment in oils. 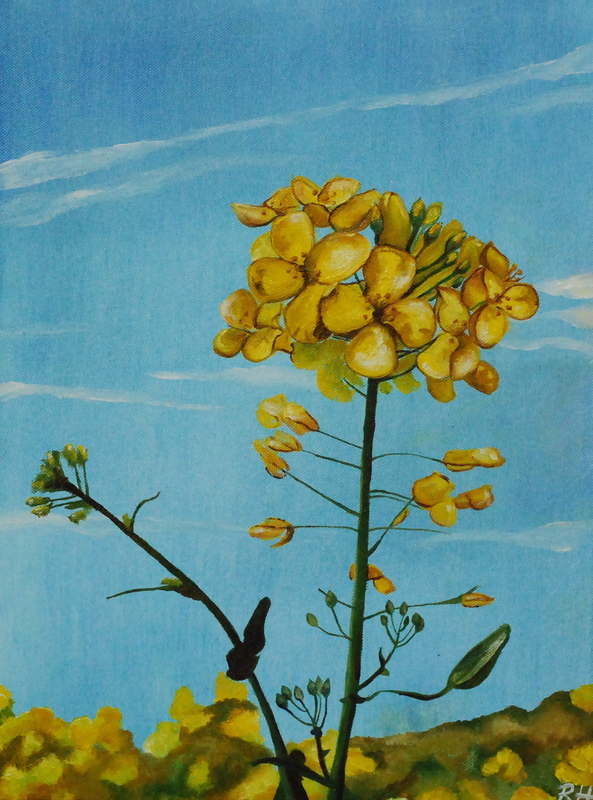 Adversary of the humble hay-fever suffer, this fiendish yellow flower has become the source of inspiration for my most recent painting. Entitled, Invasion!, this piece serves to commemorate that time of year, around late Springtime, when East Anglia is subject to a sudden onslaught from this seemingly unsuspicious beast. Noses astream and eyes ablaze from scratching, this foe sure a sinus’ worst nightmare. Such a shame, as it is rather a delightful colour combination: the cadmium yellow against that azure sky. Here we are again, folks; another weekend, another long and boring post about a painting. Ah, I’m only kidding, I promise this one will be shorter! Today I will be guiding you in the way of Dublin Society School graduate and Royal Hiberian Academy member, Richard Rothwell. 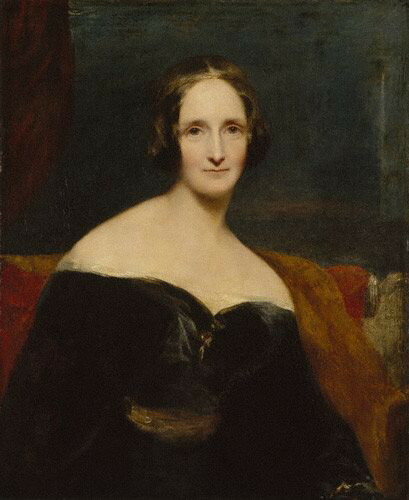 His works consist primarily of portraiture and genre pictures, but the work I will be focussing on is his study of novelist Mary Shelley, which can be viewed below. As usual I will provide you with a little background on the subject, followed by an analysis of technique, content, context and relevance to myself. All very lovely. After that dreary introduction, we’ll get down to the artwork itself. The painting above was completed by Rothwell in 1840, a year after Mary started suffering from symptoms of what was later discovered to be a brain tumour. Although those fresh, rosy apple cheeks of hers hint at youthful beauty; the haunted pallor, complemented by mournful, sunken eyes, serve as the testimony of a woman forced to live under the curse of perpetual mourning, and following that, personal affliction. This is perhaps reinforced in the way that Mary is holding herself, which appears to be quite awkward; her right shoulder hunched above her left forcing her to hold her head and neck in a somewhat serpentine ‘S’ shape. Not an unattractive woman, her slight, birdlike features – the gently pointed nose and swan-like neck – emerge from the gloom as if a rare and exquisite nocturnal creature. The overall eerie feel of the piece does bare resemblance to the literary stylings of the subject, whose repertoire includes gothic tales of dark, experimental science and apocalyptic sci-fi. When addressing the colouring of the painting, it is easy to first notice the predominant black appeal of the outfit – undoubtedly referencing the succession of unbearable losses that Mary has had to endure – as well as the humility of the muted surroundings; presenting themselves to the audience under no pretence of opulence or grandeur – perhaps signifying the poverty of her latter years. The dark russet waist-band again signifies sorrow and seriousness, and being an autumnal colour, the subsequent ‘autumn years’ of the sitter. The flame red and vermillion tones of the chair could signify her political seat -one of Romanticism and Liberalism -as Mary was well-known for presenting her political views across in her writing. Rothwell’s style creates an expressive yet careful rendition of the human form, with hints of Classicism (in the study of the face) and the burgeoning influence of Romanticism (shown through Rothwell’s choice of subject – a major player, not only in Gothic, but also in Romantic literature), which was starting to gain a strong hold over the arts at the time. This is particularly true if one views Mary as the heroic figure: an intelligent and strong female overcoming the trials of a tragic life in order to emerge triumphant as a literary genius. Or something like that. Where tremendous care appears to have been taken in the portrayal of Mary’s delicate face, half of that care is evident in the representation of her attire. Prime example being the joining of the flesh with the dress, where we can see a rather faltered marriage of paint with canvas, and no matter how firm I set my mind against it, my eye inevitably strays over to and pauses at this artistic misdemeanour. And now yours will too. Sorry. If I am to learn anything from Rothwell’s approach to painting, it would be how he uses colour and earnest facial expressions to evoke a sympathetic and sincere atmosphere about his subject, thus causing the viewer to feel warmly and gently beckoned into the company of his sitter. Well, that’s what I think anyway. Please forgive my mal-attentiveness, dear reader, for I appear to have forsaken you in favour of Easter holiday pursuits. Fear not though, for Easter – and thus my shameful neglect of you – is drawing to a close. To account for my bad manners, I will resume my analytical-bumblings-that-are-an-excuse-for-Art History with a sneak peak at what Mister Giovanni Boldini has had to offer the art world. Boldini originally caught my eye whilst I was strolling around none other than the National Portrait Gallery, with his rather seductive painting of that saucy minx, Gerty Campbell. Throwing off the shackles of restraint, with regards to anatomic representation, Boldini put to good use his somewhat flamboyant style when representing this fine fille. As the picture shows, Gertrude appears to be a voluptuous and opulent woman; clothed from head to foot in striking black; reclining luxuriously on a chaise longue, all the while making come-hither eyes at the viewer. Oh the marvellous life of the rich. Now that you have been tugged away from her penetrative stare, I will commence by providing a little bit of background on our rather glamorous subject. On May 3rd 1857 the proud parents, Edmund Maghlin and Mary Amy, welcomed their unfortunately christened child, Gertrude Elizabeth Blood, into the world. The youngest of three, Gertrude grew up with her siblings on the family estate in the picturesque County Clare, south-west Ireland. It was at the tender age of twenty-three that she met her soon-to-be hubby, Lord Colin Campbell whilst on a social visit to Scotland in the October of 1880. Ten months later, no sooner had she become Lady Colin Campbell, was our Gerty to discover that her beloved was of a particularly sickly disposition, sporting what some have later said to have been a bad case of syphilis. Nice one Col. Once the beautiful Lady had been enlightened to the infection she was now playing host to, it is needless to say that divorce was the consequence – although this was not fully processed until five years after the wedding, during which time Lord Colin accused his wife of four separate bouts of extra-marital relations. Can you wonder at it though, knowing what he had lured the poor lass into?! The newly single Gertrude Blood next turned her attention to, and subsequently became a dab hand at, journalism. Despite her peers deeming her as quick-witted, intelligent, beautiful and athletic; she was to remain constantly under the looming shadow of the messy divorce trial and shameful allegations that were a result of her troubled marriage. In 1886, Gertrude’s potential as a worthy subject for painting first became recognised when she was requested to pose for James Abbott McNeill Whistler in the portrait Harmony in White and Ivory: Portrait of Lady Colin Campbell – this was one in a series of paintings depicting beautiful women in the varying neutral tones of white. However, due to unknown circumstances, this study is no longer with us. Eleven years on from this and we find ourselves face to face with Giovanni Boldini’s above tribute to the then forty-year-old gentlewoman. With that hefty back story now firmly behind us, we can start to look at the actual artwork. Composition-wise, it is of a fairly simple structure, with the figure cutting a rather pleasant ‘S’ shape from top to base of the canvas; both suitably enticing and seductive. One thing that initially catches the eye is the positioning of the legs. They are not what one would expect to look like in a painting of a woman, as they are slightly apart. There is still a hint of delicacy and reserve, however, but more so a nod to the masculinity and power attributed, no doubt, from her sporting pursuits and noteworthy career. Moving on to the threads of dear Gerty, we can see that she is very much a champion of the LBD (‘L’ being ‘large’ in this case, as opposed to ‘little’), complete with plunging neckline (showing us that, even at forty, she has still ‘got it’) and spray of flowers (expressing, ‘Yes, I may be a strong female, but I still have a hint of dainty damsel about me and a taste for the pretty things.’) – Below is another example of Boldini’s work, entitled Profile of a Young Woman (date unknown), featuring the trademark petit bouquet and crisp, graceful clothing – But yes, back to the dress; in all its sombre Morticia Adams-esque extravagance there is definitely a high degree of classical beauty about it. Notice the folding of the drapery in all its splendour, tumbling gently down those statuesquely long legs of hers. Team that with the simple gold bangles encircling each wrist and we have ourselves quite the Grecian goddess; one that even Titian would have been honoured to represent. When faced with a portrait featuring predominantly funereal colours, it is easy for one to cling to the notion that the subject is steeped in tragedy. It is true that Gertrude was essentially given a death sentence by her generous husband, therefore one could easily put two and two together in order to describe her post marital life as one waiting to die from a then increasingly painful and ultimately fatal disease. 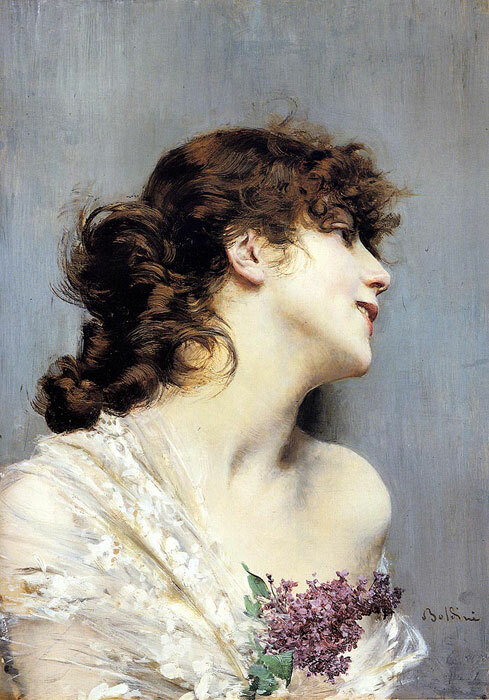 But, in terms of what Boldini was trying to show in his piece, I don’t believe this to be the case. Arguably her most successful days, and consequently happiest, were those spent after her divorce; the post-Colin days being more of an awakening than a quietening. A more plausible theory, perhaps, would be that the colour black relates instead to the authority she commanded as a result of her individual achievements – think black-belt in Karate, the highest possible honour. 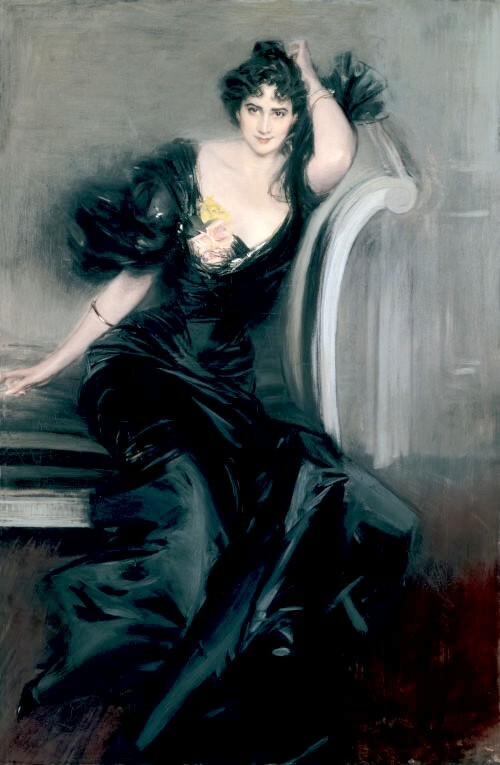 Boldini’s typical painting style is an multifaceted one, consisting of a myriad expressive brushstrokes, centring on a carefully illustrated face; the porcelain colouring of the skin contrasting sharply with the darkened tones of the attire; the dainty head perched atop an exuberantly painted body – see how the proportions are slightly mismatched in his study of Gertrude. I really love the overall energetic feel of the paintings, one which has the viewer swept up in a whirlwind of glamour and femininity. The focus is then gently settled onto the facial expression: the piercing yet flirtatious gaze of the lady, complete with a knowing smirk playing about those pert lips. InGertrude Elizabeth, the former suggests a reference to her inquisitiveness as an interviewer; the latter to her famous lightening sharp wit. All in all, we have a superbly interesting lady immortalised by an equally superb man: a man who clearly has a talent for portraying women in a way that demonstrates excellent reverence and understanding. Here is number two in my series of posts-that-are-an-excuse-to-chat-about-artwork; hopefully it will live up to the high critical acclaim received as a result of the first… Rofling aside, the following ten or so will be in response to a recent visit I made to the National Portrait Gallery in London, which just happens to be one of my all time favourite galleries – actually, it is my all time favourite gallery – playing host to a long list of British faces since 2nd December, 1856. The primary collection contains 11,000 paintings, drawings and sculptures ranging from the 16th century to the present and, in the summer, includes the famous and highly competitive BP Portrait Award competition – a marvellous platform for any aspiring portrait artist. Right then, on to the business of the paintings. Oh and please forgive me if you happen upon any blinding inaccuracies regarding the artist and his/her artwork. It is purely ignorance. 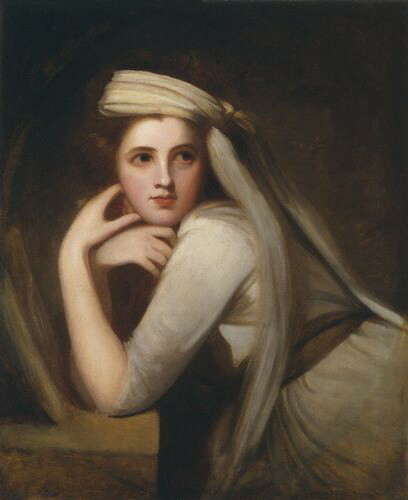 I discovered this beauty by George Romney whilst meandering my way through room seventeen of the Regency section. Emily, Lady Hamilton (née Hart) is her name and extra-marital relations was her game. Tut-tut. Yes, the baby-faced twenty-year-old daughter of a blacksmith you see in the picture was somewhat of a professional mistress; one lover even being that well-known man with one arm, Horatio Nelson. A face like this demands a proper introduction, don’t you think? Born Amy Lyon to blacksmith Henry Lyon and Mary Kidd, she grew up in the Welsh village of Hawarden with only her mother for company, due to the untimely death of her father when she was only two months old. She later changed her name to Emma Hart for some reason (perhaps ‘Amy’ was associated with being poor, I dunno). Blessed with good looks and aspirations to perform, Emma had several stints working as a model, dancer and amateur actress, before securing her first mistressing gig, aged only fifteen, for Sir Harry Featherstonhaugh. Sir Harry proved to be an insensitive host, however, inspiring the transferral of her affections onto one of his more honest and honourable friends, Charles Francis Greville. It appeared to be a happy ending, apart from the fact that Emma was pregnant with the child of former lover, Harry. Whoops. She decided that the most practical solution would be to entrust the infant into the care of relatives, yet making sure to remain in regular contact. 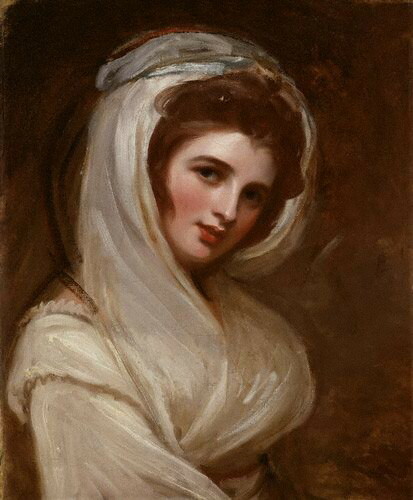 It was whilst she was mistress to Greville that Emma met the artist, George Romney, who was inspired – if not besotted – by her charming looks, thus resulting in a glut of ‘Emma’ portraits from the fellow. This elevated Emma’s status and she soon became known as ‘that beautiful, clever and funny girl’ amongst high society. Sickening. This dream was to be shattered, however, and to cut a long story short, Greville wanted to get married so palmed off twenty-six-year old Emma onto his uncle, sixty-year-old Sir William Hamilton, whom she later married. Nice. When it comes to assessing the meaning behind the piece/s in question, we need to refer back to Romney’s encounters with young Emma. They were introduced through Francis Greville, who intended to only have a few paintings commissioned of the lady for reasons close to his wallet, but subsequently George became rather struck with her, deeming Emma to be ‘the divine lady … superior to all womankind’ (Letter, 19 June 1791). Quite the complement, don’t you think? It appears that the chap became rather obsessed with Miss Hart, impelling the production of more than sixty pieces, which could be divided into four categories: life studies; allegorical and symbolic; genre scenes; and expressive sketches. 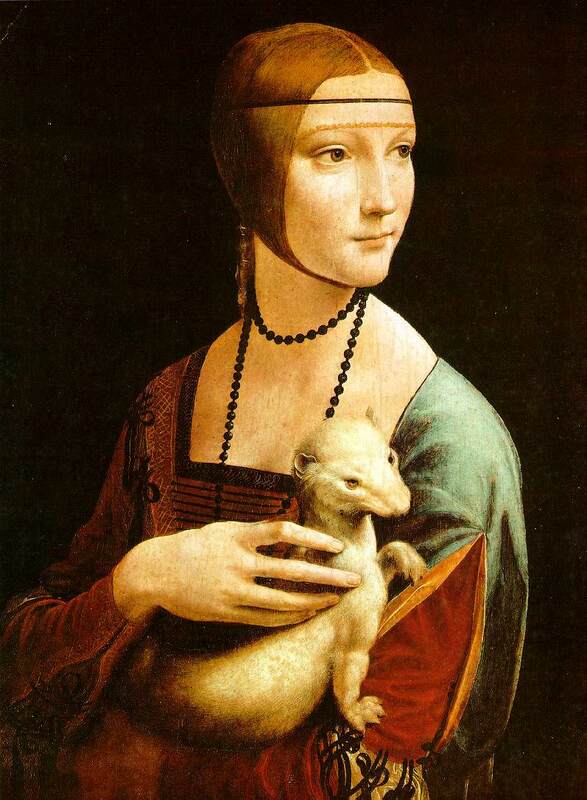 The paintings above fit nicely into the life study category, making use of Romney characteristic soft, muted colours – I know I mention this all the time, but it is such a nod to the sfumato technique as employed by the Renaissance masters, da Vinci and Raphael. There are, in particular, strong Raphaelite qualities about the style in which Emma was painted; a style which prides itself on immortalising any subject into a sublime and ethereal beauty, where perfection is but a whisper away. Of course, it did help that Emma was stunningly gorgeous in the first place – there is a definite aura of porcelain doll about her. If we look back then to assessing what exactly Romney’s designs were for these two studies, we can see that he is trying to subtly represent the various personality traits (mentioned above and here: wit, charm, grace, intelligence etc.) of the captivating individual through use of suggestive gestures and looks – the playful tilting of the head; the meaningful glance and the positioning of the hands. Lastly, I shall explain to you just why I absolutely love the work by the hand of the infatuated George Romney. Primarily I think that, along with most human beings, I am fascinated by the notion of aesthetic perfection – the flawless, velvet skin; glossy, wide eyes; button nose and pert, berry lips – and on this, Romney delivers in abundance. There is also nothing harsh about the images, as the subject appears to melt into view from the darkness; creating a charming appearance of curiosity and coyness. I am one for using this technique in my own work, for the main reason of making the subject stand out against the background – like in Annie for example – but obviously Romney does it far better. In addition, I take great delight in following the paths of the expressive brushstrokes used in the second piece to illustrate the flowing attire worn by Emma. 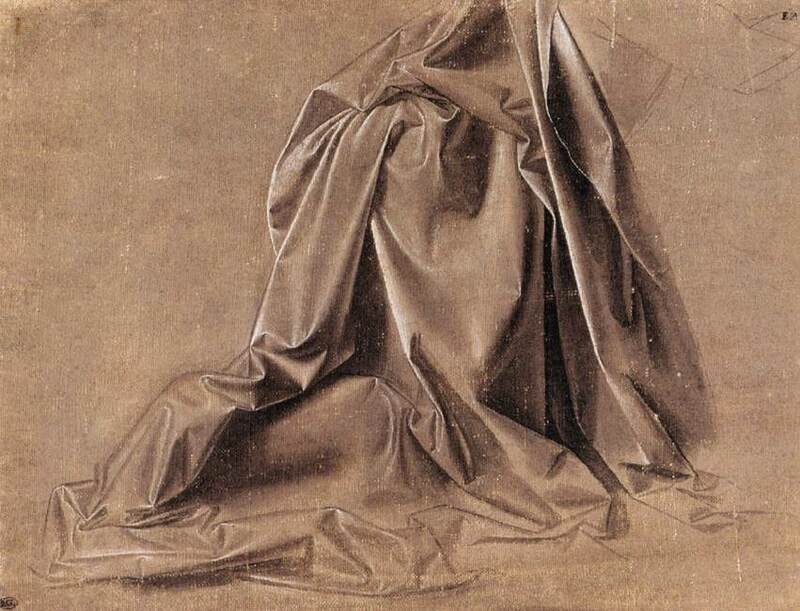 As a sucker for great drapery, this is somewhat of a refreshing alternative to the refined techniques of, say, da Vinci. Overall, fantastic artist, gorgeous sitter; the dream combination for any portrait exhibition, no? 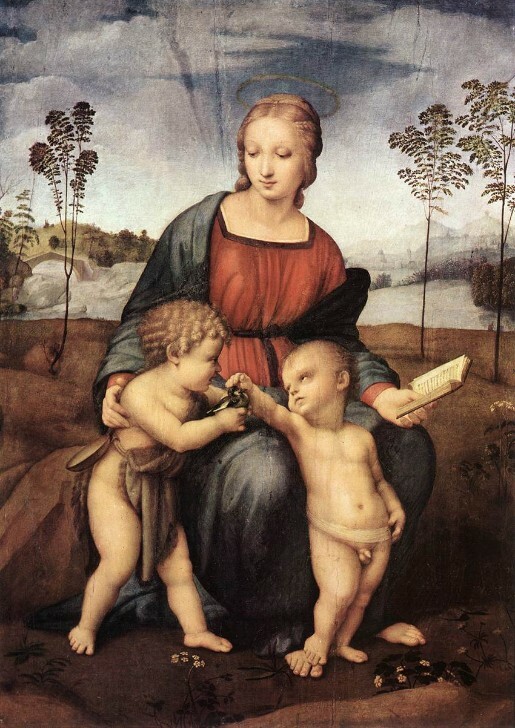 To kick things off I have decided to take a peek at this sepic beauty by Raffaello Sanzio – Raphael to his mates – entitled, Madonna del Cardellino, which literally means Madonna of the Goldfinch. The subjects can clearly be seen as the Virgin, John the Baptist and Christ, placed in triangular formation with the central focus being on a small goldfinch: the object of interest between the two holy infants. What is the symbolic relevance of this seemingly insignificant bird? you may chirp. Well, according to the RSPB, the humble goldfinch is one for rooting around in thorny hedgerows and thistles in order to find a nutritious seed or two. In my mind, there is an instant connection that can be formed between the habits of the goldfinch and the Parable of the Sower, Mark 4:3-9. The seed that fell amongst the thistle patch was an allegory for the word of God being heard but overshadowed by the temptations of the world, likewise the seed that the goldfinch is feeding on … Hmm, where am I going with this…? Right, yes the more obvious reading of the goldfinch is that its thorny habitat is a direct nod to the humiliating crown of thorns the unbeknown infant Jesus was to later endure, heads up courtesy of Johnny boy. (Actually, He must’ve been ‘beknown’ as according to Christian belief He is God and consequently privy to the master plan, therefore the kind heads up from John wouldn’t really have been necessary, but instead a kind, cousinly gesture…). In addition to the goldfinch, the book that is delicately held in the Virgin’s left hand provokes a certain degree of inquiry in itself. In this case it is seen to signify wisdom, thus attributing the Virgin the title of Sedes Sapientiae; the Seat of Wisdom; the Mother of God. In other words, she’s in on the whole thing; deep down, she knows how things are sadly going to pan out for her son. The painting itself has had to undergo a fair amount of restoration in order for it to look as it does today. No doubt this has been partly down to the wear and tear that comes with the territory of a 500 year-old existence, however, the main contributing factor would have to be the fact that the building it was housed in collapsed at the end of the 16th century due to an earthquake; breaking it into seventeen pieces. The building in question was the home of Lorenzo Nasi, a friend of Raphael to whom the painting was gifted as a wedding present. What an amazing present! Although, I don’t envy Nasi the daunting duty of having to tell Raphael that his masterpiece had just been creamed by an earthquake. And now to the symbolism found in the colouring of the Virgin’s clothing. Here we see red, the colour of passion and love – a palpable reference to the love shared between family members, the most natural of them all being the unyielding bond between mother and child. Also, the red could connote the blood that was to be shed by Jesus, linking to the crown of thorns reference from the goldfinch. The blue denotes a sense of calm and stability – a reflection of the natural surroundings we find the Virgin in – as well as the obvious: royalty. In terms of how this relates to my own practice, I would first like to highlight the technique employed by Raphael. Yes, he was very much influenced by the heavyweights, Michaelangelo and da Vinci – noticeably with his use of da Vinci’s sfumato method – however, there is something that one simply cannot deny Raphael and that is his representational view of beauty. 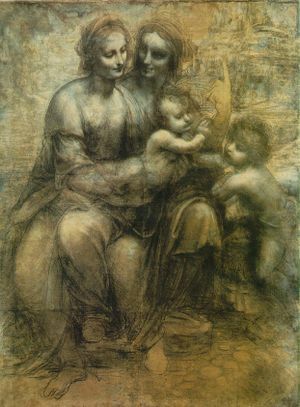 This beauty is discovered in the way that he composes his figures – their playful yet exquisite interaction with one another; his understanding of the tenderness shared between mother and son – just look at how the barefoot Jesus stands gently on top of the bare foot of his mother, such a subtle form of closeness; and, most prominently, his use of graduated sepia tones that melt together to form the perfectly soft skin of his subjects. An altogether wonderful combination that I have repeatedly tried to recreate; whiling away hours blending and blending and blending again my oils in an attempt to reach skin-supremity. But alas, I have not reached it. Yet. Skipping up the famous front steps of the National Gallery – with ticket in cold, clammy hand – it was only feverish anticipation that was running through my mind for an exhibition I had been waiting for what seemed like a decade to finally see. Having been kindly bought a ticket, I was confident that nothing could get in between me and my precious Madonna of the Rocks (Paris version, of course), however, it so transpired that I had misjudged this somewhat. Not only did it take us a good ten minutes to reach our supposed goal – involving careful negotiation of the heavily-coated, typically slow-moving tourists, interspersed with a frantic exchange of whispered directions from me to the boyf – but once we had reached it, it was only to be met by a kind-but-tired-faced guard who regretted to inform us that we were in fact in the wrong place. Where we needed to be meant retracing our steps back into the claustrophobic main gallery, before taking a few lefts, a few rights, some stairs and you’re there. Simple. 15 miles below the surface later and we had made it to da Vinci’s underground extravaganza. First impressions were pretty good and perhaps enhanced by the fact that we were able to breeze past the queues of fools who forgot to pre-book – also making up for the initial confusion of finding our way. The information leaflet told us that the exhibition itself comprised mainly of da Vinci’s work completed during his time as the court painter of Ludovico Sforza – the ruler of Milan – spanning from 1482 to 1499. Venturing in, we were enlightened as to exactly how much work that was. Reams of buff-coloured pages taken from his famous sketch-books paved the way through the semi-darkness – perfect conditions for viewing such delicately handsome artwork – pausing only for something grander and more colourful, those majestic paintings of his. I won’t spend my time nattering about each individual painting and sketch, as that is what the guide book is for – and frankly, you probably couldn’t care less – however I will provide a small lowdown on what I would consider to be the top three pieces. My favourite piece, though, had to be, The Burlington House Cartoon (1499-1500). This softly captivating charcoal and chalk sketch was a major source of inspiration for me during my Sixth Form years, where my foray into portraiture really began. 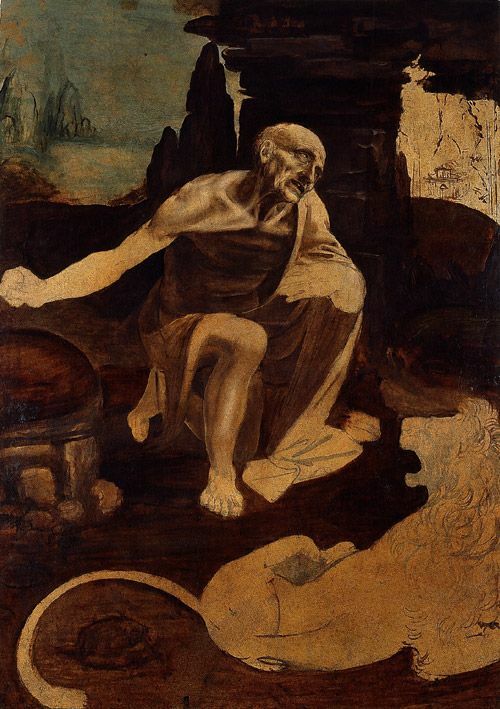 Again, the sfumato technique so often employed by da Vinci undoubtedly leaps to the fore. There is veracious beauty to be found amongst the burnt charcoal, smokey sepia and ochre tones; the fluid movement of the drapery and the tender thoughtfulness of the composition – altogether portraying perfectly the unyielding bond shared between mother and child. Disregarding the fervent jostling for position one was required to take part in in order to see the masterpieces on show – one would assume that the idea of the ticketing system would allow for more than a glimpse of the corner of a caption for a painting – the exhibition was well worth a visit. The sheer quantity of Leonardo’s sketches alone is enough inspiration to shake any complacent artist out of their stupor, not to mention the blindingly brilliant skill he had for capturing the very essence of the human form. I, for one, now vow to paint more and procrastinate less. This morning I happily stumbled upon this series of beautiful figurative studies by Russian artist Anna Shukeylo. Her marriage of expressive strokes and clever composition provide one with an thoughtful insight into human interaction – which can appear, at times, overwhelmingly blatant or otherwise reflected through quiet gesture. An inspiring way to start the day in any case!